Allow Me to Introduce Myself.... PART TWO!!! I'm Julie Albright, but you can me Jules or Jule, or just pain Julie. And along with Addy I'm one of Katie's newest dolls. But because of trying to introduce other dolls and a couple more lame excuses that humans usually give, it took FOREVER to actually appear on here. But I'm here now, so be excited! Before you ask, yes, I'm on top of a car, don't ask how I got up here. There are way too many ants to be standing or sitting on the ground. Moving on... So I guess Addy did this whole, five facts about me thing? And now Katie wants me to do it too. So I guess that's what I'll have to do. I'm sure the ants have been scared off by my awesomeness by now so let's do this! Here comes fact number one. I'm not trying to be mean or anything! I'm honest with them because I love them, but sometimes I guess I don't realize what I'm saying could be a little harsh. But as epic as that fight was it left me with chew marks battle scars up both of my hands, arms, and holes in my cloth body. which means I can't wear certain outfits or my stuffing will fall out. 3. I take hip-hop with Molly at her dance school, it's really fun! I love busting out random moves like this one, just to see if Molly will follow along. 4. I'm a black belt in karate, so yeah, you should be terrified. Like as in I barely make it over 17" inches. Ugh guys! It's so annoying! Even Connie's taller than me, and she's 12! And Samantha's super tall, my eyes line up with her nose! IF YOU TELL ANYONE ABOUT THAT I SWEAR YOU'LL BE SORRY!!! Anyways, that's me. 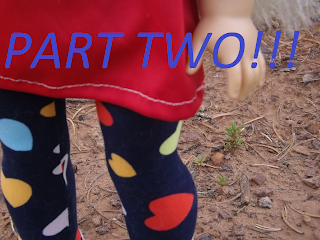 I hope you enjoyed getting to know more about this doll standing in front of the camera. You can now say you've witnessed the rays of utter coolness that flow throughout my doll body. Well, time to chill, see ya guys later. I GOT THE DOLL!!! I was so shocked and thankful to hear my name called! Thank you so much to my teachers for casting me in this role even after my audition! It means the world to me <3 And a doll wasn't the only part I got, I also got cast in Snow and Waltz Flowers! Thank you so much for the support and encouraging words everyone! I really appreciate it so very much! Here's to hoping your day is as epic as you are! Congrats on the partsss! That must be super duper exciting :) Love Julie's character. I also love her "the ants are afraid of me" thing. Hahahaha! Thank you Tess! I am, and also super shocked XD thanks, I had a lot of fun with it. LOL yep, that's Julie for ya XD Thanks for commenting! CONGRATULATIONS KATIE! IM SOOOO HAPPY FOR YOU! Yayyyy Julie! She’s so cute! Thank you SO much!!! You are so sweet :) Aww thanks! Awww, she's adorable! I loved her introduction and I can't wait to see more of her. Congrats on the part! liked it and I can't wait to write more stories about her :D Thank you!!! Thank you Jewel! I'm SO excited about them! Thanks! I'm so glad you enjoyed it :) Oh no worries! I totally understand, I'm not sure why Blogger does that, I have the same trouble on some Blogger sites I follow as well. I don't usually have that kind of trouble with WordPress sites I follow, but I'm just not sure about switching LOL XD I do really appreciate that you still check my blog though! JULIE?!??!?!? I was sooo wrong, lol!